Hann Dual Station Drafting Tables make it easy for two artists or students to work simultaneously. The workstations feature two desk areas with tilting adjustable tops, so users can adjust each surface to suit their specific needs. These tables are great for drawing, drafting, and art making in a classroom or studio. The tabletops are made of 3/4" thick Fiberesin, which provides a hard, flat, smooth work surface. The adjustable tabletops tilt with a ratchet-type mechanism, and each drawing surface has a pencil ledge. In the center section, six lockable drawers — fitted with master-keyed cylinder locks — offer secure storage. 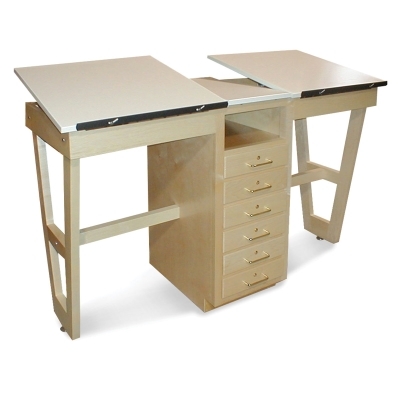 Made in the USA, Hann Dual Station Drafting Tables are handcrafted one at a time by skilled craftspeople. They're made of North American hard maple for strength and durability. Built to last, the desks feature full face-frame construction, and their face frames are constructed with mortise-and-tenon joints. The tables ship fully assembled — only the drawer handles need to be attached. The heavy-duty drafting tables have a natural finish and are available with A-Frame or H-Frame legs. A-Frame — Each tilting top measures 24" × 24". The center section has an open bookshelf and six drawers. Each drawer measures 2-1/4"H × 11"W × 19-1/2"D inside. The fixed center top is 12" × 24". Overall, the desk measures 36"H × 60"W × 24"D.
H-Frame — Each tilting top measures 28" × 32" and the fixed center top is 12" × 32". The knee space under each drawing area is 19-3/8" wide. The center section has six drawers. Overall, the desk measures 39-3/4"H × 70-1/4"W × 32"D.